A. Vogel Eleutherococcus - more commonly known as Siberian Ginseng. Used for Physical Stress - Helps to improve physical performance. Used for Psychological Stress - Helps to enhance mental performance. Lastly, used for female hormone balance - e.g menopause. Drops to be added to water. Siberian Ginseng is from a different plant family than Korean Ginseng and has traditionally been used to combat the effects of stress, fatigue and improve stamina and energy. It does so by supporting the body's ability to restore itself after these physical and mental stresses. 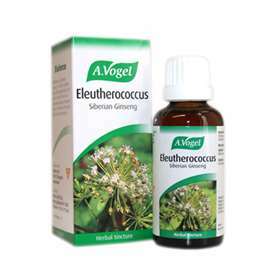 Also, Eleutherococcus is believed to have a balancing effect on women's hormones. Combined with Ginseng's energising action, menopausal women in particular might find this helpful. Regulates metabolism rates in tissue. Adults: 20-30 drops twice daily in a little water. There are no restrictions on long term use. Not recommended if pregnant unless advised by a healthcare professional. If you suffer from hypertension, anxiety, schizophrenia or if you are on medicines for heart disorders, nervous disorders, epilepsy, diabetes or take the oral contraceptive pill or HRT - seek advice from a health care professional before using this product. Not to be taken along side other stimulants such as caffeine. If you are also taking vitamin B & C supplements, take these at a different time of day as it aids their secrteion. Healthy people under 40 years of age, should not need to use Ginseng.